DBA's 4000 Series XS rotors feature our best technology & materials for maximum performance. High carbon & heat treated iron; patented Kangaroo Paw ventilation and a unique drill & slot pattern makes the perfect direct replacement rotor. 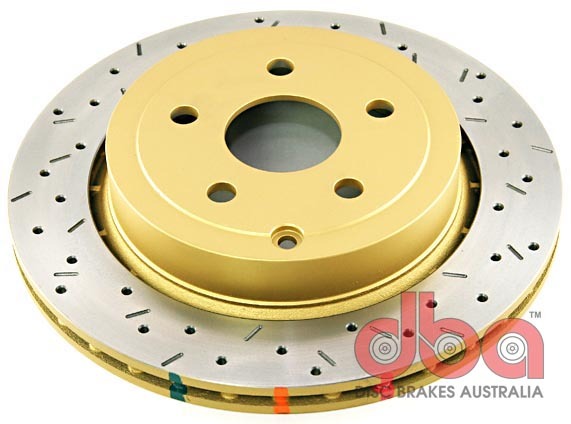 Disc Brakes Australia or DBA manufactures disc brakes and braking parts for car manufacturers from all over the globe. DBA started out as a small Australian manufacturer and has become one of the leading distributors of disc rotors and brake pads renowned for their innovation and performance. DBA is the maker of the EN-SHIELD direct OEM replacement disc rotor. This rotor is finished using DBA’s patented En-Shield coating to prevent rust and corrosion on the rotor surface. The En-Shield coating is water-based, non-toxic, and chromium free. DBA is also the innovator of the Kangaroo Paw Ventilation design. This design allows DBA disc rotors to outperform and outlast conventional rotors even during the most demanding street and track conditions. The Kangaroo Paw Ventilation design consists of 144 diamond and tear-shaped pillars to cool the disc rotor by up to 20% more than straight vane rotors. The main enemy of a high-performance braking system is excess heat. The right magnitude of heat will allow the pads to produce more friction on the rotors for shorter stopping distances. But if the disc overheats, your vehicle will lose sufficient braking power. The Kangaroo Paw Ventilation design is precisely designed to increase the heat dissipation of the rotor to prevent brake fade, whether you’re on the street, highway, or race track. DBA is also the maker of the T2 Bi-Symmetrical and T3 Tri-Symmetrical brake rotors. The T2 is better suited for street applications. The T3 has tri-symmetrical curve slots to further reduce vibration and is designed for racing or track applications. Sam’s Motorsports is proud to carry an assortment of DBA brake rotors including the Street Series T2, 5000 Series T3, Cross-Drilled and Slotted, and the 4000 Series T3 at friendly and affordable prices. 2011-2014 Chevrolet Caprice DBA 4000XS Drilled and Slotted Brake Rotors, The DBA 4000XS Drilled and Slotted Brake Rotors is designed specifically to fit your 2011-2014 Chevrolet Caprice without any modification to your beloved Chevrolet Caprice. DBA 4000XS Drilled and Slotted Brake Rotors will also fit 2008-2009 Pontiac G8. If this DBA 4000XS Drilled and Slotted Brake Rotors is not exactly what you are looking for to accessories your , please don't give up just yet. Our catalog has huge variety of parts and accessories for your .